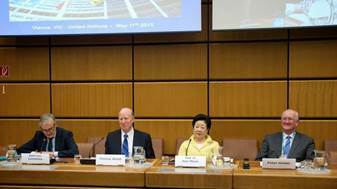 On May 11, 2015, completing a three-day celebration of “50 Years Unification Movement in Europe”, a special event was convened at the United Nations building in Vienna, Austria, on theme “The UN at 70 : Toward a resolution of tensions on the Korean Peninsula”. The meeting was co-sponsored by the Universal Peace Federation (UPF), the Women’s Federation for World Peace (WFWP), ACUNS Vienna, the Segye Times and Sun Moon University. 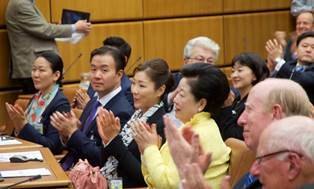 The event commemorated the 70 year anniversary of the United Nations and the 70 years since Korean independence, as well as the 60 year anniversary of the State Treaty whereby Austria was granted independence from Allied Powers after a 10-year occupation following World War II. The treaty had been signed based on the promise that Austria would remain neutral - promise that enabled Vienna to be designated as the third UN seat in the world and the second UN seat in Europe. 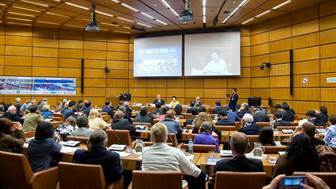 The conference aimed at addressing issues related to the future of the United Nations and its impact on peace in Northeast Asia. Dr Hak Ja Hak Moon, Co-Founder of UPF and WFWP, offered the keynote address. 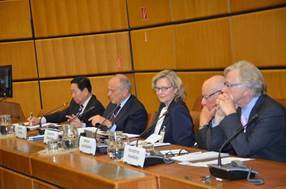 Then, a panel of high level experts from both Europe and Korea considered what enhanced role the United Nations could play in Northeast Asia, raising in particular the prospects of establishing a fifth UN office on the Korean Peninsula. Expressing the beauty of Korean culture, the Little Angels Children’s Folk Ballet graced the audience with a moving cultural performance. The event was introduced by Mr. Peter Haider, president of UPF-Austria, who moderated the first session and put into perspective the various anniversaries it commemorated. Mr. Jean-Luc Lemahieu, Director of the Division for Policy Analysis and Public Affairs at UNODC, greeted the audience on behalf of the United Nations. 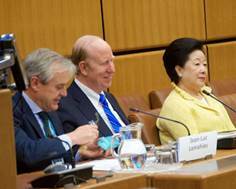 He reminded the audience that for the UN, 2015 was not only a year of significant anniversaries but also a year of launching a new campaign worldwide for sustainable development. He also spoke fondly of his early years in Korea as a young diplomat, when he came to particularly appreciate Korean culture. 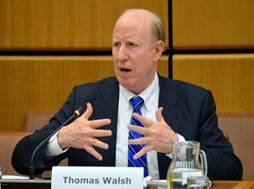 Dr. Thomas Walsh, President of UPF International, then gave a broad review of significant peacemaking efforts in Europe, from the Vienna Treaty following Napoleonic wars to the League of Nations following World War I, to the post-World War II creation of the United Nations – whose first major challenge was the Korean War in 1950. He went on to explain the central role which the UN plays in the UPF Founders’ vision for world peace. Reviewing various peace initiatives launched by the late Dr Sun Myung Moon, he underlined his proposal, in August 2000, to set up an interreligious council at the United Nations, as he was foreseeing the crucial role religions would play in conflicts in the 21st century. He also emphasized the tireless speech tours around the world by Dr Hak Ja Han Moon promoting family values as the core foundation for a peaceful world. 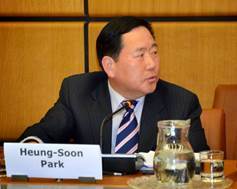 Dr. Hak Ja Han-Moon, UPF and WFWP Co-Founder, then gave the keynote address. She outlined the key role of the United Nations in God’s Providence. Speaking of the challenges faced by the UN to bring 193 nations into harmony, she stated that only a God-centered perspective could help achieve that goal. “The movement to attend God has to take place at the UN”, she said, adding that only God’s parental love could unite all mankind. “I want everyone to become the children of God”, she concluded, saying that the issue at stake was not only the tensions on the Korean Peninsula, but the conflicts that affect the whole world. 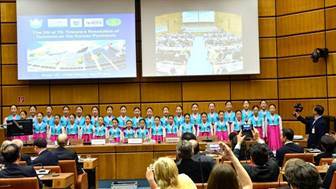 The session concluded with international songs by the Little Angels of Korea, a children’s troupe well known for representing the beauty of Korean culture around the world in the past 50 years, and for promoting peace through the arts. 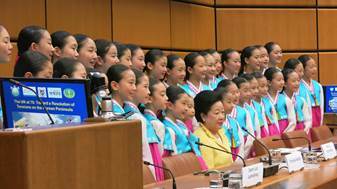 The harmonious beauty and talent expressed by the young Korean girls, particularly their joyful rendition of Austrian yodeling, enchanted the audience. The following panel session’s topic was: “The UN at 70: Perspectives on Peace and Security in the Korean Peninsula and Northeast Asia”. Mrs. Carolyn Handschin, President of WFWP in Europe, introduced the session by outlining the proposal of “Peace Zones” made by UPF Founder Dr Moon at the UN in 2000. She also raised the issue of establishing a UN Office on the Korean Peninsula, theme already discussed in a 2014 UPF conference at the UN in Geneva. Four distinguished speakers, UPF Peace Ambassadors, stood on the panel. Dr. Walther Lichem, former Head of the Department of International Organizations at the Austrian Foreign Ministry, spoke on the role of ‘good citizen countries’ in the community of the United Nations. “Good citizen countries”, he said, often in contradiction with major powers, are countries whose political objectives are not focused on narrow national interests, and whose security or development interests are best served by enhanced international law and human rights and based on solidarity and community-building. 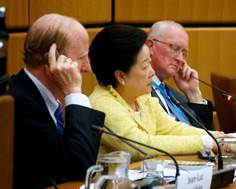 Noting the increasing role of “good citizen countries”, among which several European nations, in defining UN global agenda, like the objectives of sustainable development or human security, he noted that Korea is now joining the group of good citizen member countries of the international community. Dr. Willem Van Eekelen, former Minister of Defense of the Netherlands, spoke on the lessons the Korean Peninsula could learn from the European experience after World War II. Describing his personal experience with the unification of Germany, he emphasized that statesmen from major nations involved in that historical process wisely pushed it through when the time was right. Noting the challenges facing the unification of Korea, he outlined some positive moves that could be taken to help open North Korea, and expressed his support for the idea of bringing a UN office in Asia on the Korean Peninsula. Prof. Park Heung-Soon, Dean of the Graduate School at Sun Moon University, Korea, a scholar on United Nations issues, reviewed some factors influencing Korean unification. He listed some of the challenges, like the distrust accumulated between North and South, the unpredictability of the Northern regime or the interests of powerful neighbor countries. Lessons could be taken from German unification or from the recent political opening of Asian countries like Vietnam or Myanmar, he said. After referring to the current South Korean president’s proposal for establishing a Peace Park at the DMZ, an idea also proposed by UPF Founder Dr Moon at the UN in 2000, he explained that the idea of establishing a UN office in Korea was gaining support among Korean leaders. The last speaker was Mr. Humphrey Hawksley, BBC World Affairs Correspondent, founder and former Head of BBC’s Asia Bureau in Beijing. After commenting on British and European politics, he gave insightful and mind-catching remarks on East Asian integration and the challenges facing Korean Unification. He pointed out the lack of shared values and common vision conducive to potential conflict among East Asian nations, despite remarkable economic achievements and growth. Describing eloquently the potential consequences for the region of internal chaos in North Korea, he underlined the fact that it remained the most dangerous country in the world, yet was largely ignored by major nations. “It would need a well-respected NGO, he said, whose ideology may be different but whose leaders treated them as brothers” to undertake a process of discussion promoting the establishment of a UN Office at the DMZ between North and South Korea. Other major nations in Asia would need some convincing, he said, but that is a project worth working for.